Donnelly made his debut for Otago in 2002 and became a regular member of the side in 2003, fulfilling his early promise. 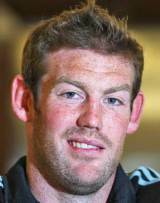 His appearances in 2004 were restricted by injury, but he caught the eye in 2005 for both the Highlanders and Otago in tandem with All Blacks lock James Ryan. As a result he was selected at lock for the Possibles side in the 2005 All Blacks Trial but did not make the full squad. The Rotorua-born forward, who failed to earn any honours for New Zealand's age-grade teams, finally gained international recognition with the Junior All Blacks in 2006 and was selected again in 2007. New Zealand coach Graham Henry finally handed him his first start for New Zealand against Australia in the 2009 Tri-Nations clash in Wellington. His All Blacks bow - at 12 days short of his 28th birthday - made him the fourth oldest debutant of the professional era.